Life's building blocks can form in the harsh environment of deep space, a new study suggests, bolstering the odds that a comet or meteorite strike may have jump-started biological evolution on Earth. Linked pairs of amino acids called dipeptides can take shape in space-like conditions, a team of chemists found. Dipeptides brought to Earth aboard a comet or meteorite billions of years ago may have then catalyzed the formation of even more complex molecules necessary for life as we know it, such as proteins and sugars, researchers said. "It is fascinating to consider that the most basic biochemical building blocks that led to life on Earth may well have had an extraterrestrial origin," study co-author Richard Mathies, of the University of California, Berkeley, said in a statement. 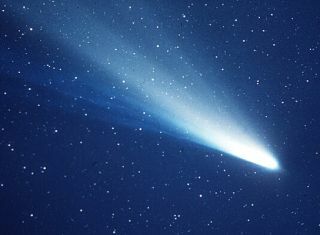 The chemists created a mock mini-comet in the lab, chilling a mixture of carbon dioxide, ammonia and various hydrocarbons such as methane and ethane down to 10 degrees above absolute zero (minus 442 degrees Fahrenheit, or minus 263 degrees Celsius) in a vacuum chamber. They then zapped the mixture with high-energy electrons, simulating the effect of impacts by cosmic rays — fast-moving charged particles that pervade our Milky Way galaxy. The electrons sparked some interesting reactions. The team detected many complex, carbon-containing organic molecules, including nine different amino acids and at least two dipeptides. The new study, which was published online last week in The Astrophysical Journal, breaks ground by showing that molecules as complex as dipeptides can probably form far from Earth. But it also adds to a growing body of evidence indicating that organics may be common throughout the solar system. Amino acids have been found in comets and meteorites, and organics swirl about in the thick, nitrogen-based atmosphere of Saturn's huge moon Titan. Many researchers think organics are also common on the dwarf planet Pluto and other objects in the Kuiper Belt, the ring of icy bodies beyond Neptune's orbit. Follow Mike Wall on Twitter @michaeldwall. Follow us @Spacedotcom, Facebook or Google+. Original article on SPACE.com.